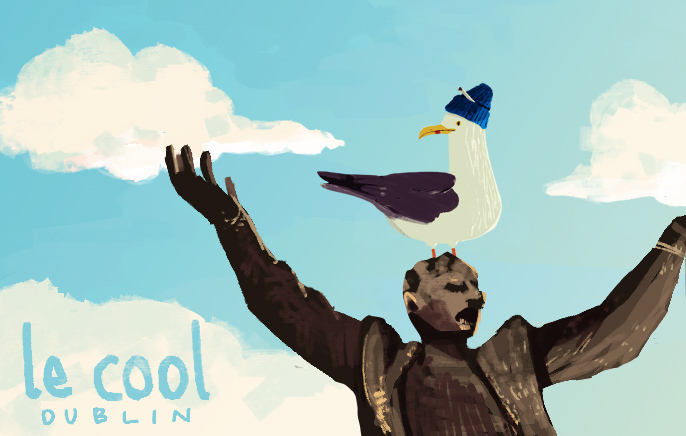 At the start of the year there was a call for submissions for covers for le cool Dublin. I thought I might as well and hashed out the above then locked my laptop into my room and went off to mainland Europe for ten days forgetting to actually send the file before I left. In the time I was away the deadline day passed and being up in a sleepy corner of Sweden I was painfully aware there was nothing I could do about it. After that I just had to get over it and move on. Then a few weeks ago I was contacted my le cool asking if I would do TWO covers for them and an interview. It's amazing how that happens sometimes. I have the lovely people at huntandgather.ie to thank for that. Kyoto Through Coffee has done a lot to put me on the radar as an illustrator as well as a food person. So this week was the first of the two covers. You can see article on le cool HERE. It's a bit artifacty and naff due to the requested jpeg format BUT!! A very nice limited edition print of it will be available on my soon-to-be-open webshop. You can expect to be able to preorder it from early next month.